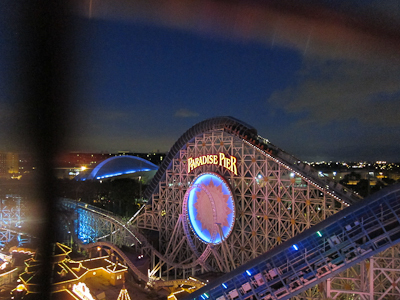 Over at the Mouse-Next-Door, Mickey’s Fun Wheel is the giant ferris wheel that looks over Paradise Pier. It’s awesome. 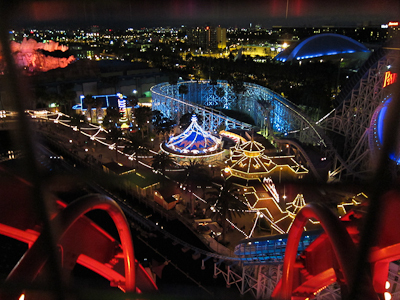 This picture was actually taken from the Zephyr, but I'm including it here because I didn't take a full-on picture for the Fun Wheel post. Oops. As you can see, it’s pretty much all kinds of awesome colors at night. 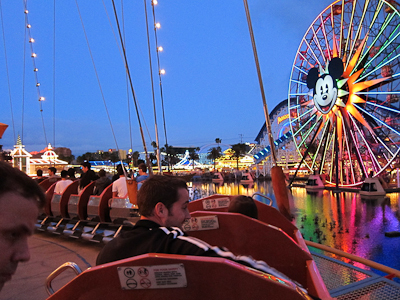 Mickey’s Fun Wheel has two options for your riding pleasure: Brave and Wimp Swinging and Non-Swinging gondolas. The non-swinging gondolas are attached to the wheel like a normal ferris wheel seat would be (and spellcheck keeps wanting me to type Ferris. As in Save Ferris? I mean the movie, but isn’t the band originally from Orange County?) (UPDATE: A sharp-eyed reader confirmed that the ferris wheel is named after its inventor, George Washington Gale Ferris, Jr., therefore is indeed properly written Ferris wheel) . The swinging gondolas swing. It’s hard to tell from these pictures because I didn’t really get any good close-ups of the swinging, but they are on an oval-shaped rail (also attached to the wheel) and the car can then swing back and forth as the wheel turns. And the gondolas have barf bags in them, so seriously, not for the faint of heart or the faint of stomach. Do I need to say that we chose the non-swinging ones? Fortunately you get to pick before you get in line. 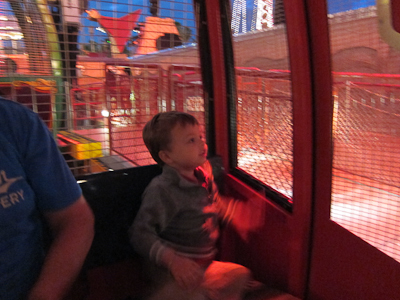 Oh, also, the gondolas are completely enclosed, so nobody throws anything out of them. 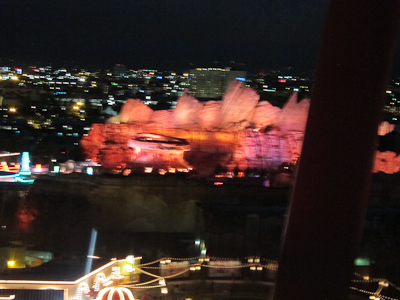 The Fun Wheel gives you the best views of the park. 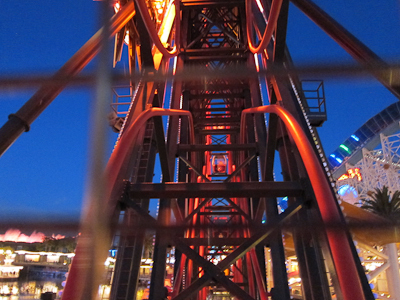 Paradise Pier has some of the best lighting I’ve ever seen. You really go very, very high. Like you know when you’re even or above the giant roller coaster, that’s high. You can even see our house from up there. 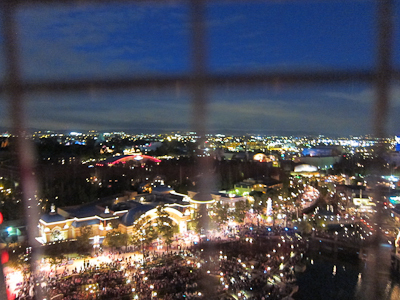 And that’s the crowd for World of Color at the bottom. Go on the Fun Wheel. It may seem like meh, it’s a (save) ferris wheel, but once you get up there, the views are breathtaking. Yep, another reader confirmed the same. I updated above, but am leaving the capitalization because, well, without it the story doesn’t make sense :lol:. 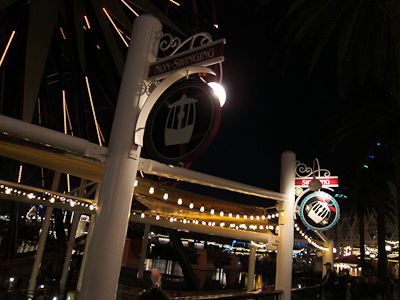 The swinging gondolas are my least favorite thing at California Adventure. I shudder to think of my one brief experience with them, when I had to grit my teeth and stare down Death. The wimp/non-swinging is scary enough – I can’t imagine going on the swinging ones! Also I might add that getting up higher (especially at night) the temp drops a number of degrees. I’m always surprised how much colder it gets up there! Oh yeah–it gets cold! You don’t really realize how high it is until you get up there. I love the swinging ones! My major issue with the ride is that it always goes one time around only and stops at each gondola, so you never get a good swing! I’ve heard that it does in fact go around more than once, but never when I’m in it! Well there’s always a line for the swinging gondolas, so clearly someone agrees with you :lol:. On this last ride we did go around twice, but that was the only time I recall doing that.